An earth-healing stone, Larimar connects to the energy of the earth goddess, helping women to reattune to their innate femininity and restoring their connection to nature. Mentally, it brings serenity, clarity, and constructive thought. 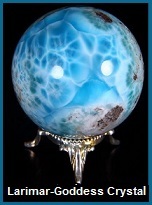 Emotionally, Larimar brings calmness and equilibrium. It heals trauma to the heart and reconnects to natural playfulness and joyful childlike energy. It stimulates the brow, heart, crown and throat chakras. It can be placed on these chakras and any constricted joints or painful spots. It will dissolve energy blockages and quietly draw out pain. Isis Crystal is named aptly after the Goddess Isis because it assists in triggering self healing with inner power and strength. 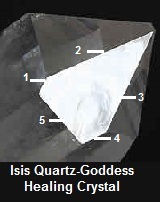 Isis Crystals have a five (5) sided tear drop shape on the dominant side of the crystal face (see illustration). This crystal is extremely useful for healing anything that is broken-body, mind, emotions, or spirit. It can be used to integrate spiritual energies into the emotional body, bringing in more balanced and joyful emotions. An Isis Crystal is beneficial for anyone who is facing transition, especially to the next world. Picture Jasper is said to be the Earth Mother speaking to her children. It contains a message from the past within its pictures for those who can read it. This stone brings to the surface hidden feelings of guilt, envy, hatred, love, and thoughts that are normally pushed aside, whether from the present or past lives. It brings comfort and alleviates fear. It stimulates the immune system and cleanses the kidneys. Picture Jasper instills a sense of proportion and harmony by balancing the Base Chakra. 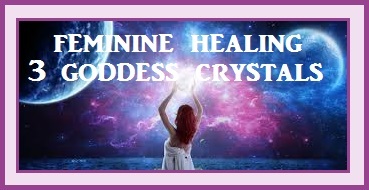 When using this Goddess Crystal, the physical body regains its strength and stamina, and the spiritual energy is rekindled in the form of security and sense of one’s own power.